Say what you will about the Mariners over the years, but at least they’ve thrown the American League’s last three no-hitters. And, say what you will about the significance of a no-hitter, but they’re undeniably exciting and cool, sometimes little oases of elation in a year that’s otherwise lost. You don’t need to overthink it. People like no-hitters. People like them because they’re neat. 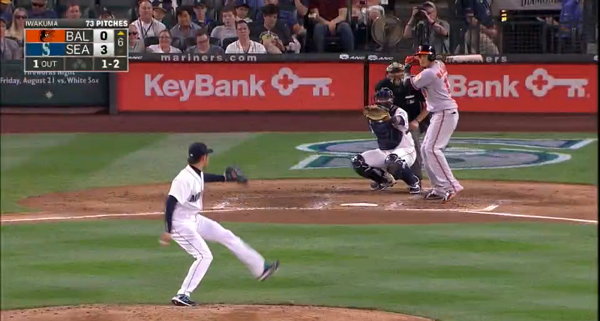 Hisashi Iwakuma just threw one, Wednesday afternoon in Seattle against the Orioles. The Orioles can hit pretty well! It wasn’t the biggest surprise in the world, because Iwakuma has a history of being pretty good. It still qualified as a legitimate surprise, because Iwakuma had never before completed a major-league game, and this year he hasn’t entirely been himself. Much like Robinson Cano, it appears that Iwakuma has only righted himself too late to save the Mariners’ season. The best to hope for now is the occasional cool moment, and Iwakuma delivered as much as he could. There’s something of a formula to writing about these. At least, when writing analytically. A no-hitter is a good game, much like a one-hitter is a good game, and a two-hitter is a good game. There’s always a little bit of luck involved, so no-hitters tend not to be particularly predictive. The analysis sometimes takes some of the fun out of it, if the achievement is sufficiently downplayed. I do think there’s value in pointing out how a no-hitter could’ve easily been ruined. I also think there’s value in appreciating how many things have to come together for one of these to happen. You don’t have to think about luck dismissively. You can think about it thankfully. Sometimes luck turns a good game into a game people will remember for years. Two or three pitches, say. I’m going to show you two videos. These were two outs. Two missed locations, two long drives, eventually snared. Were it not for Austin Jackson, both of those would’ve landed on the track in center field, and it would’ve taken an imperceptible difference off the bat for both of those to be homers. Iwakuma wound up with a no-hitter. It could’ve easily been something different. 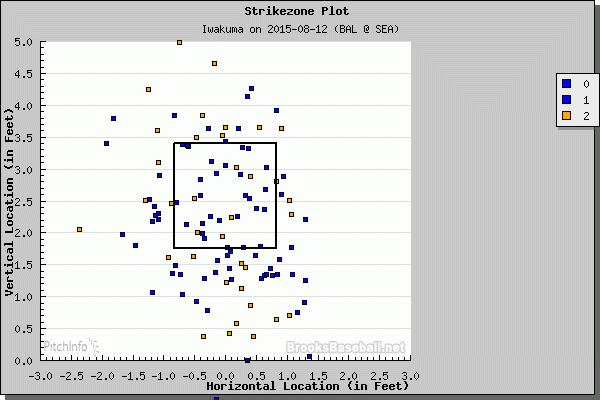 It could’ve easily been more evidence that Iwakuma is good but a little homer-prone. There’s nothing wrong with pointing out how the game could’ve changed. It shouldn’t spoil the feeling; it just goes to show how difficult it is to get everything to break in your favor. If you’re holding out for the ultimate, perfectly-pitched no-hitter, you’re going to miss a lot of enjoyment. There, you see some pitches down the middle. Not too many of them, but some of them, and on average, you’ll have a starter throw three or five or eight pitches down the middle in a game. A few missed locations can make all the difference. Iwakuma was particularly sharp Wednesday, and maybe that goes without saying, given the result. You don’t think of Hisashi Iwakuma as being a guy with a fastball that gets elevated with two strikes, since he’s more known for his sinker and splitter, but that was a dangerous pitch for him. Previously, on the year, 15% of his two-strike pitches were elevated fastballs. Wednesday, he was at 31%, changing up his game plan and potentially catching the Orioles off guard. There was a lot about catching the Orioles off guard, actually. Chris Davis talked about the importance of Iwakuma getting ahead, but even when he worked in counts with more balls than strikes, he pitched backwards, throwing fastballs just a quarter of the time. So, the Orioles weren’t able to sit on heat on the rare occasion they had the count in their favor. More often, Iwakuma was able to throw strike one. Through the first three innings, eight of his nine first pitches were fastballs. Through the next three innings, that dropped to two of 11, before bouncing back to six of nine for the last three innings. The Orioles saw 29 first pitches. Two-thirds of them were strikes. The only one put in play was the very last one, which happened to be Iwakuma’s fastest pitch of the afternoon. In the middle innings, as Iwakuma’s splitter rate went up, his fastball rate went down, like you’d expect. But then in the final third, his splitter rate went up more, and his fastball rate almost fully recovered, meaning those pitches came at the expense of sliders and curveballs. 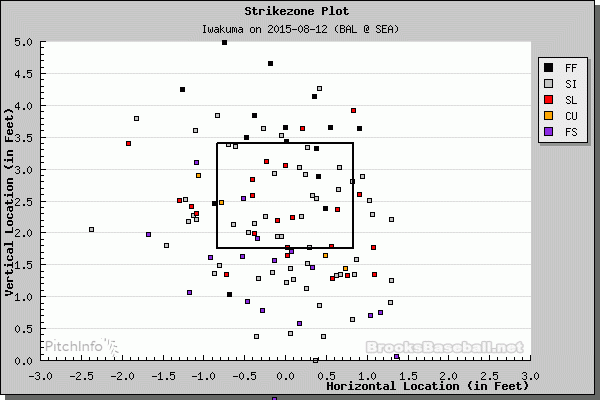 A shorter way to put it: for each third of the game, Iwakuma showed a different strategy. He went from fastball/breaking/split, to fastball-split/breaking, to fastball/split/breaking. That doesn’t do a great job of conveying the mix. Iwakuma was changing, basically, and the Orioles weren’t able to read him from one section to the next. Every pitcher is supposed to avoid predictability, and the results would suggest Iwakuma did his job. 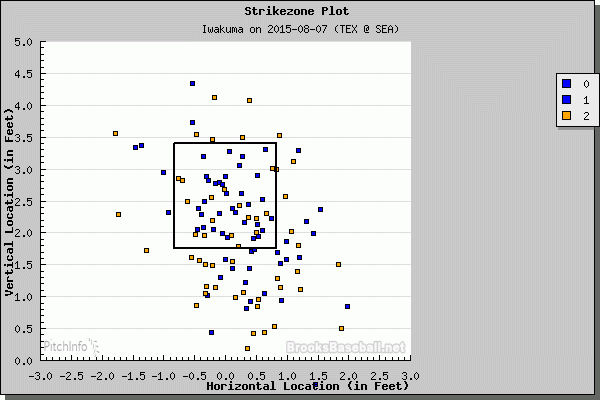 Iwakuma and Sucre had a good plan, and then Iwakuma executed almost every single pitch. That’s the recipe for a phenomenal outing, because when pitchers are able to do precisely what they want to be doing, hitters are left with little chance. So much of hitting is feasting on mistakes, or taking advantage of favorable counts, and when there aren’t many mistakes, and when there aren’t many favorable counts, hitting is the most challenging thing in the world, and the Orioles are the latest display. Could’ve been a game with a couple of dingers. Iwakuma wasn’t perfect, and that same outing doesn’t always go for a no-hitter if it’s repeated over and over and over again. In this game, Iwakuma made some history. Safe to say he deserved it. We hoped you liked reading Inside Hisashi Iwakuma’s No-Hitter by Jeff Sullivan! 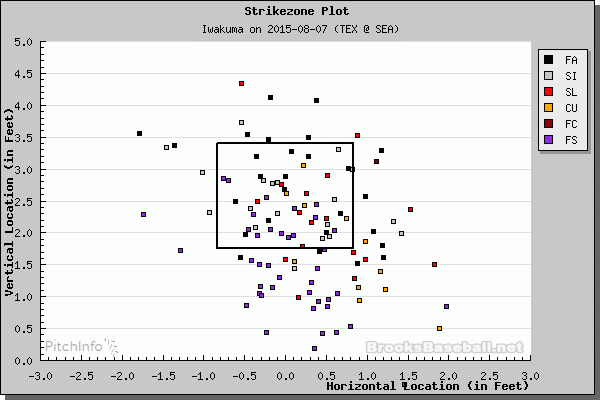 Nice pitching by Iwakuma, and nice analysis here. The Orioles didn’t do much to make him get the ball up, were not patient, and had 3 players – Lough, Flaherty, and Paredes – who are pretty much terrible hitters in the lineup. It’s depressing being on the other side of this, especially when you’ve been sort of waiting all season for the team to show some life, get a bit hot. There’s still time, but things like this make it seem like it’s not going to happen this season. One wonders if Iwakuma had been healthy all season whether the Mariners couldn’t have been floating near wildcard contention. Also an O’s fan… Having watched this one, even the Orioles solid hitters like Machado and especially Jones looked completely lost at the plate. There’s the GIF of Jones hitting that shot to straight away center, but outside of that one bit of solid contact, he looked as lost as I’ve ever seen a hitter against Iwakuma yesterday. Last year the Mariners won 87 games, and had the best record of teams left out of the playoffs in the AL, and the Orioles seem to be headed in a similar direction this year. As a M’s fan I wonder how the Orioles season would’ve been different if they had resigned Nelson Cruz. Just like everyone else I am really surprised that he is hitting better than last year.